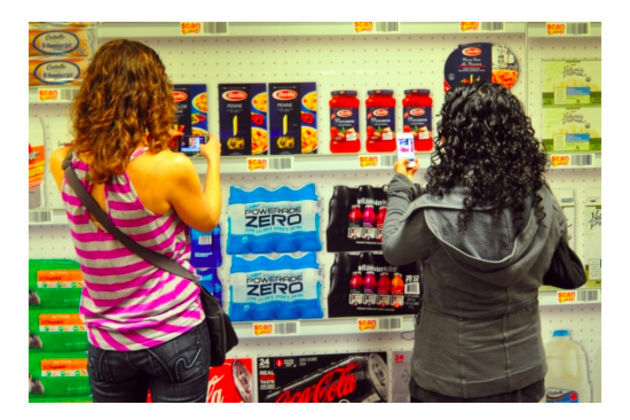 Visual Interfaces for Mobiles @ NCSU: Find and thoughts: Peapod 'virtual grocery stores' -- a gimmick? Or an improved experience? Find and thoughts: Peapod 'virtual grocery stores' -- a gimmick? Or an improved experience? Peapod is a holdover from the dot com bubble. It delivers groceries ordered online to your door. With this experiment, is it showings that its customers want more than an online shopping experience. What could be missing? And will these virtual shelves provide it? Freshness: traditionally store goods are fresher. Not sure that's still true now. Directness: you can see and interact directly with what you buy. Prompting: as do online menus, shelves remind you of what you want. Society: the grocery is a kind of town square. We bump into folks we know and don't know. We meet our community. Immediacy: you get what you want now. Will these "virtual" displays bring some of this experience to Peapod? Certainly not freshness: this won't change the quality of the food. Directness may improve a bit with larger images, but I'm betting that they aren't sharp. I have a hard time believing that these relatively small posters (in comparison to real shelves) will remind people of much, though it may remind them simply to shop. Meeting an acquaintance while pausing in front of a poster is less likely than when lingering in a separate store outing. And immediacy won't improve: the food won't arrive sooner, and ordering could always happen on the go. What this really is then, is a cheap vending machine without the immediacy. It reminds people to buy, makes it easy to do so, but you won't see it for about an hour. The idea is clever, but in the end, I think it's just a good ad. Maybe Peapod should get into the vending machine business. But seriously, how could Peapod deliver more of the grocery experience? Maybe with social features? And how could grocery stores improve? Perhaps what is on the shelf at the moment should always be online for delivery or at least pickup? Online supermarket Peapod is bringing its foodstuffs to Chicago's "L" transit system, with a new ad campaign that allows commuters to do their grocery shopping from directly within the city's train stations. Last week, the company plastered Chicago's State and Lake Station Tunnel with a "virtual grocery store" ad — posters of grocery shelves stocked with popular household items and food products. People travelling through the station can scan an accompanying QR code to download the free PeapodMobile app, which will allow them to scan barcodes listed on the products displayed in the ad. With the app, iPhone and Android users can place orders, manage their shopping lists, and schedule deliveries as they wait for the next train.